Give the perfect gift from the heart. 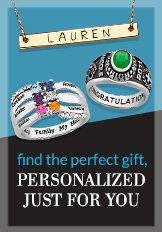 Stand out from the rest of the gift-givers this year by with a personalized gift from the heart. This personalized Family Names and Birthstones Heart Necklace has it all, including interlocking triple heart pendants with a classic design that says, "I love you". Our customized birthstone heart necklace features Austrian crystal birthstones that can be fitted with as many as 6 names, and reminds Mom or Grandma that you will always be near to her heart. Our exclusive birthstone necklace has the richness of gold plating, is suspended on an 18inch chain, and measures 2inches wide.